We made it. The Venom/Poison events are finally done. Fifteen books. Sixty something dollars, and what do we have to show for it? I genuinely have no clue what exactly it is that the overall story was trying to convey. Venomverized didn’t seem to know what it wanted to be and suffered for it, giving us a very forgettable and expensive story that wishes it was the Venom event of the century, like it said it would be. No, not that it’s a high bar, but I think that that honor will go to the launch of Donny Cates’s Venom book next week. Spoilers, but who cares? Last week, I said that I had hoped Bunn would be able to surprise me and stick the landing in the space of two issues, but it seemed he would have to do it in one instead. Actually, I’m only left with more complaints. I would have thought that after so much writing, he would have come up with a really clever and climactic way for the Poisons to be defeated. Something he’d be able to step back and look at and say, “Yeah, people are going to love this.” No. Instead, the victory is earned entirely by one character, who hasn’t even appeared since the X-Men: Blue crossover. A big deal is made out of getting a team of heroes to the ship to destroy the Poisons at the root, but in truth, they could have just waited it out on Earth instead. The idea that a Poison’s control is no longer permanent is reinforced in this issue, and put back to back with their frustratingly easy defeat, it actually impressively successful in cementing them as some of the worst, most laughable villains ever. A Carnage vs. Spider-Man and Venom fight sounds like a good idea, but it’s used as a stepping stone to injure Spidey so that his symbiote can heal up. 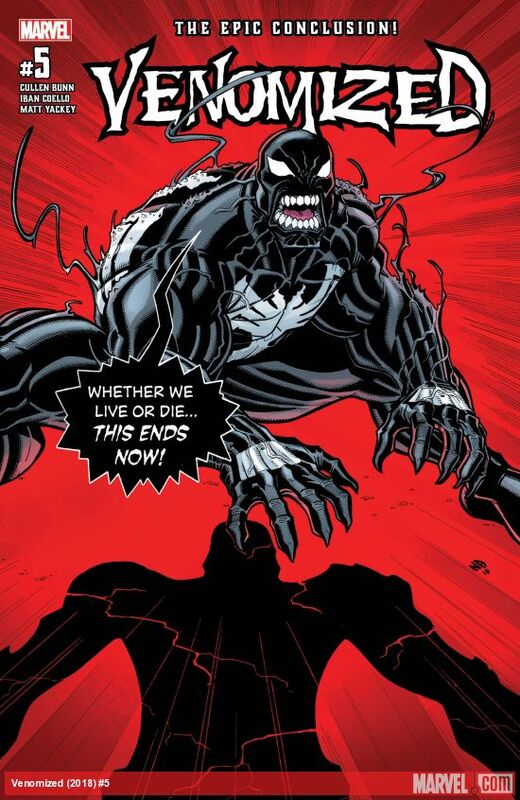 So that he can be cool with symbiotes now. Again. If there’s anything I can commend this issue on, it’s that it’s at least more successful in tugging at your heart strings, if only a little bit. Scragg’s good bye is unexpectedly powerful. Scragg, actually, stole the show. He masks his friendly battle cries with an aggressive tone, and it thankfully isn’t a joke that’s played to death. Maybe I had adjusted to our previous artist, but with Iban Coello back, some faces feel a little too exaggerated. The strong anime influence was an advantage of the book before, but in some cases here, I feel that it is crossing that line. The action is pretty impossible to follow, for the most part. Movement is usually just shown in a pose in one panel, with characters in very different positions in the next. In some cases, it’s easy enough to fill in the blanks. In others, you have no idea what happened, how this person got there, or how that person got injured. Matt Yackey on colors has consistently kept the book to a higher standard. Much as I was (for some reason) let down by the climax of the story, using pink and white to represent the force of…uh, love, that defeats the Poisons is a nice touch, and a great example of how he knows how to convey emotion even in an event that isn’t too heavy on it.